MAIN POINT: If God does not give up on us, why do we give up on ourselves? This week, I share 7 reasons why we ought to press on. A Happy New Year 2012 to all my readers! On the last week of 2011, I had pockets of quiet moments to reflect. Like the preceding year, I preached on New Year's Day. Again. Thus, my countdown celebration had been mixed with both anticipation of the New Year and at times anxiety about whether I would be too tired for a morning message. Thankfully, our service started an hour late, as we knew that most people would appreciate an additional hour of rest for New Year's Day. In my sermon, I challenged my congregation live beyond their average lives. Based on 1 Cor 12:31, my intent was to prepare my hearers for the pulpit theme for January 2012: Love according to 1 Corinthians 13. After my sermon, I was exhausted. When I arrived back home, I watched "Dolphin's Tale" with my daughter. It was a good movie, and a nice way to simply chill out on a cold and rainy day. From tired, I became moved. I was inspired. The story was a dramatization of a true story of how a little boy (Sawyer Nelson) became re-energized about his own calling, and how he channeled this calling into saving the life of a dolphin. I was particularly fascinated by how Lorraine talked about her son's revived energy and passion. It was like a lamp inside him had suddenly lit up. Before I share 7 points about not giving up in the midst of adversity, let me reflect on the passage above. Like Hosea 6, Hosea encourages the people to hope in God, and to never give up. He urges them to 'press on to acknowledge the Lord.' Punishment is not forever. Redemption will finally come. Great Family Movie: 5 stars! Coming back to Dolphin's Tale, there are many elements of how those who have been down and out manage to press on despite their struggles. Firstly, the movie shows Sawyer as a boy without passion or energy. He goes to school late. He hardly pays attention in class. He looks uninterested in anything. Until one day, he sees a wounded dolphin landed on the beach, whose tail is caught by a nasty crab trap. He develops a special connection with this dolphin. As he tries to help the dolphin survive and live, little does he realize that he has triggered an inner desire and purpose to live: To save the dolphin. From that day on, Sawyer becomes a passionate boy pressing on toward doing all he can for the dolphin. KEY: Hosea recognizes his calling to be a prophet for a kingdom doomed to destruction. Imagine how Hosea feels when he sees only the threats and the coming judgment. Thankfully, he sees God's hopes more and the threats of judgment less. Hosea does not simply pronounce judgment. He announces hope. Secondly, both Sawyer and his friend Hazel have something in common. They are children of single parents. Together, they share a common bond in trying to help the dolphin called 'Winter.' It is encouraging to see that when one suffers, one needs not suffer alone. In one very special scene, when Sawyer laments about his dad who 'never calls' and 'never writes,' Hazel chimes in about her feeling the same way about her own mum. Pain when shared is halved. It seems like in moments of disappointment, one can find comfort and understanding with those who have gone through somewhat similar experiences. In other words, we are able to press on with the help of fellow strugglers. KEY: For us, we can think of Jesus as a fellow sufferer, persecuted by the world. It is because He has suffered, we too can press on in spite of any disappointment or suffering. Pain shared is halved. Thirdly, due to the extensive damage and potential infection, Winter's tail has to be amputated. Without a tail, Winter cannot swim. Worse, it can lead to early death. With the lack of financial support, the rescuers are looking at the possibility of putting down Winter humanely. Just when all hopes seem lost, one of their friends agree to build a new prosthetic tail for free! That raises hopes in the midst of an impossible situation. Thankfully, the story's characters do not simply give in to their circumstances and give up on their hopes. They press on with whatever little they have. KEY: Losing a part of us does not mean all hopes are lost. One small flicker of hope shines brighter than a large shade of gloom. Time and again, the dolphin refuses to wear the tail. Each time a tail is put on it, it destroys it in no time. This is not only financially damaging, it is emotionally discouraging. It seems like the dolphin is destroying its very hope for survival. Yet, Dr Haskell presses on. Until Sawyer reflects on a possible reason for the rejection in the first place. When all hopes seem lost, Sawyer brilliantly comes up with a reason why Winter does not like the new tail. Sawyer eventually saves the day for all. KEY: When the same way fails, try a different method. Sawyer's cousin, Kyle, was once a champion swimmer serving with the military forces. Unfortunately, an accident leaves his right leg maimed. Kyle goes into depression and refuses to live for anything. The turning point arrives when he sees some similarity between Winter and himself. He sees how his cousin, Sawyer, presses on to keep Winter alive, and at the same time, keep encouraging Kyle. Toward the end of the show, Kyle was seen proudly swimming his best, with his artificial limb, just like Winter was swimming with its artificial tail. Sometimes in life, we learn to press on when we see someone else doing their best to get back to normal. KEY: God can use anyone to encourage us, even a dolphin. Hazel's father, Dr Haskett had poured his money and energy in building up a non-profit hospital for animals. Without additional money, they would have to close down the whole operation. As they prepare to shutter the doors, to give all their animals away, and call it a day, that would also mean certain death for Winter, as no buyers wanted Winter. Someone came up with a great idea to have a "Save Winter Day," a day in which they would highlight their plight to the world, and showcase Winter the amazing dolphin. Miraculously, it worked. Eventually, they landed a generous donation that allowed their entire operation to continue. It took a creative idea to avert a near certain disaster. KEY: When we do our best, we let our best shine for all to see. When that happens, chances of a dramatic turnaround are higher. When all hopes seem lost to men, it is never lost with God. God always has a better way. We need to give ourselves time to hope in God. The story of Dolphin's Tale is not simply about a dolphin's tail. It is about the spirit of pressing on, regardless of the mountain of challenges. Scene after scene, we see how every adversity has been overcome by a sudden turnaround of hope and faith. Sometimes, like the case of the failure of several prosthetic tails, one discouragement leads to another. During moments like these, we need to remember to press on, perhaps through another creative manner. As long as we do not give up, there is always hope. My fellow readers, as we begin this New Year, we will all experience our fair share of ups and downs, happiness and sadness, encouragement as well as disappointments. The Bible tells us to hope in God. It tells us to press on. It calls us to look always to God. The certainty of God's coming is as certain as the sun that will rise in the morning. It is as certain as rain that will come one day to water our crops. It is because Jesus says He will come again, we can be sure to see it becoming a reality. Soon. Press on. If you find it hard to press on, do yourself a favour. 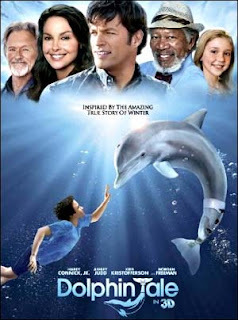 Watch "Dolphin's Tale." Thanks for this timely article. I had been through very rough times for the past 2 years. I wouldn't know how I got through without God by my side. Things are still not looking up for me at the point I am writing this. However, I will rest my hope in God...Amen. Thank you for your comments. I appreciate your sharing about the tough times. Feel free to email me if you want to share in confidence.